I have to admit from the outside I wasn’t quite sure what to expect when we pulled into the small, cramped older shopping center. It really wasn’t much from the outside and if you aren’t paying attention you could easily miss it. The interior decor was a little bland with a creamy tan paint all over. They did have little nick knacks around the place to kinda break up the paint but over all it was just ok, it needed something and I am not sure what that something was. They had a few tables set up outside which was great especially on our nice spring days here in the valley and because the inside was crowded so it allowed there to be enough seating for everyone. I would definitely suggest going early if you are going for lunch, we got there a little before 11:30 and the line was almost out the door. It did move quickly so that says something about the service, the staff was friendly and they were moving through the guests in line seeing if anyone needed help with just pastries or bread to keep the line moving. 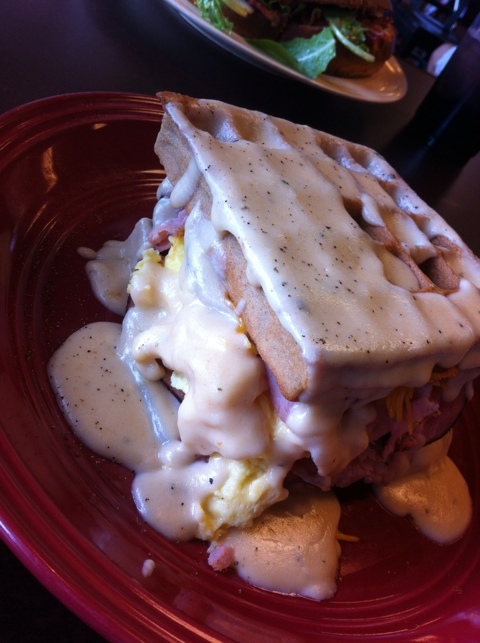 Now on to the food I had the egg, ham & cheese waffle sandwich with a rosemary béchamel sauce on top. This was so yummy and very rich, the eggs and ham paired very well with the waffles and béchamel. This rosemary béchamel sauce was absolutely the star of the show on the plate. The only downside was the sauce could’ve been hotter. It was luke warm once it got to me, so it quickly became cold which I didn’t really like but truthfully powered through because the flavors were all there. I think this would be a great dish to share with someone, because it has two giant waffles a hearty helping of eggs, ham and cheese. Then after sharing you could get one of their delicious pastries. The sharing of course takes away calories so the pastries will be less guilty. I unfortunately did not have any of them even though they looked just divine. I was just so full on this sandwich and I didn’t even finish all of it. My mother had the BLT grilled cheese with a side salad. 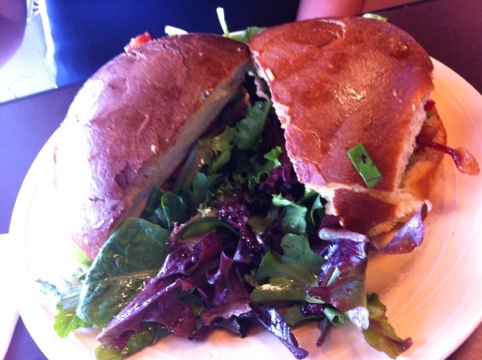 I unfortunately did not try this sandwich because of the tomatoes (I am allergic), but my mother said it was delicious, the fresh tomatoes, sun dried red peppers and fresh greens all combined with melted cheese. She was pleasantly surprised that she got a side salad with her sandwich, because originally she debated on getting a salad. But she did say that side salad was a little heavy on the oil, next time she would order the dressing on the side. The table next to us did have a table full of salads and they all looked delicious. The downside to this place being so busy when we got there it did make the wait for our food was a bit long. Especially for a lunch break from work. I think it is possibly the reason my sauce wasn’t hotter when it got to me maybe it could have been sitting waiting to be delivered. I am not sure if this is the reason or if it just wanted heated up all the way. As much as I dislike slow service I can understand that there is only so much they can do when they have a restaurant full of hungry people. I would definitely say if you are in the neighborhood or just looking for a change to make the trek to Anthem and give this place a try. Just don’t be shocked if you you walk in and are greeted with a line, it will move quickly and it will be worth the wait.